The Pilates Teaser is a very difficult exercise to perform correctly. It is an advanced exercise and should only be performed after correctly executing the intermediate level exercises first. To challenge students I have worked with for years to attempt this exercise I will list a way to modify this classic Pilates move that will help you feel confident and happily surprised that you can complete it safely and precisely. Start balanced on your tailbone with legs extended and arms reaching towards your feet. Chest is high with your shoulders down and the back of your neck is long. 1. Inhale hold your balance to prepare. 2. Exhale as you articulate the spine down down the mat. Reach your waistband to the mat while your legs simultaneously lower as you bring the rest of the spine, shoulders, and then head down. 3. Stretch your arms over-head on the mat with legs long. Inhale as you stretch then exhale to circle the arms out curling the head and shoulders while simultaneously peeling the spine and legs back up into the Teaser or “V” position. 4. Repeat this Pilates exercise for 6-8 repetitions. Check out this Pilates move and more of the classic Pilates exercises and modifications in the new Pilates ebook available here. Start balanced on your tailbone with knees bent and holding under the knees. Chest is high with your shoulder’s down and back of your neck is long. 2. Exhale as you gently press your heels away still holding behind the knees and articulate the spine down, reaching the waistband to the mat. 3. Bend your knees up into a table top position (90-degree angle) as you bring the rest of the spine, shoulders, then head down. 4. Stretch your arms over-head on the mat letting go of the legs keeping the knees bent up at a 90-degree angle with feet off the floor. 5. Inhale as you stretch then exhale to circle the arms out to the sides reaching under your knees again and start curling your head and shoulders while simultaneously peeling the spine and gently pressing the heels down and out as you curl back up to the balanced “V” position. 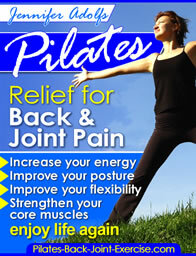 Find more great Pilates moves on the new Pilates for Healthy Back and Joints. Get your Pilates DVD today. Stability Ball Pushup for Balance and Strength! Pilates Bridging for Pelvic Stability. Pilates Side Kicks for lean and toned thighs. Leave Pilates Teaser and check out the Pilates Cat Stretch to loosen up a stiff back.